Back in the days when Britain still had a car industry of its own rather than just a series of assembly shops for foreign manufacturers, we were still able to produce cars that were quintessentially British - and fewer cars were more quintessentially British than the Humber range. 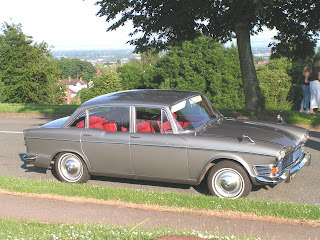 The Humber Super Snipe from the mid sixties was typical of the sort of car Humber produced. On the outside it had handsome and understated lines with touches of flair such as the wrap around grille. Inside it oozed quality with sumptuous leather seats, quality instruments housed in a highly polished wooden dash and room enough to hold a small party. Although I never personally drove a Humber Super Snipe, I had the pleasure of being driven in one on a few occasions when I was young. Being in such a car was an event in itself for a working class lad from Slough, but I can imagine that owning and driving such a car when it was new was a life affirming event. For me, just opening the door and climbing into that voluptuous interior made me proud to be British - the car just breathed Britishness from every pore - but when it was underway it was even more impressive as it wafted along effortlessly. It seemed to make a statement about Britain - refined manners combined with a quiet power - a Britain which, like the marque itself, is now long gone.